Thousands of daily Ryanair travelers are now protected in the event of a cardiac emergency, after the European-based airliner installed HeartSine Automated External Defibrillators (AEDs) on all its flights. 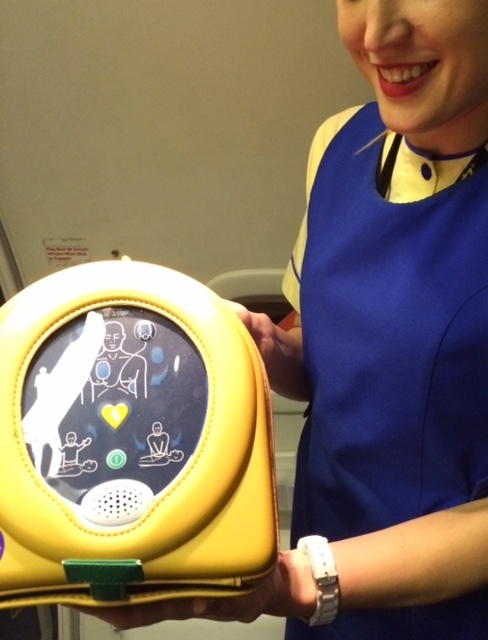 The on-board HeartSine samaritan® AEDs will protect Ryanair employees and travelers in the event of a Sudden Cardiac Arrest (SCA), an often life-threatening malfunction of the heart’s electrical system, which causes it suddenly and unexpectedly to begin to beat rapidly, then erratically, and finally to stop altogether. The news was of great joy to AED Campaigner, David Makinson, who petitioned airliners last year following the fatal in-flight SCA of a 47-year-old woman. “The flight attendant I spoke to on board was delighted by the development, having witnessed failed attempts in the past to resuscitate passengers using CPR only. It does of course also now mean that the cabin and flight crews are also safer than they were previously, though she was far to gracious to mention that”, says Makinson. With 84% of Sudden Cardiac Arrest (SCA) incidents taking place outside of the healthcare setting, including during commercial flights, an on-board AED is a must have for the safety of both passengers and crews of all aircrafts.